Finally, a movie for all those people who asked, ‘gee, I wonder what Larry Mullen, Jr. looks like up close in 3D.’ ‘U23D’ is a movie that lives up to its title. This is simply, a 90 minute concert by one of the world’s best stadium-sized rock bands in the world today. Shot during the South American leg of their ‘Vertigo,’ tour, this film documents a band firing on all cylinders. The anthems, the touching moments, the audience participation; it’s all on display in this movie. While many movies shot in the 3D process try to hype up the format, to play with the fact that Bono looks like he’s in your lap, one must credit directors Catherine Owens and Mark Pellington for keeping it simple. There are very few gimmicks. No intentional swinging of the neck of the guitar by The Edge, to give the audience a momentarily thrill. Bono, at times, notices the presence of the cameras and does play to them, but, as the undisputed public face of the band, that’s kind of his job. 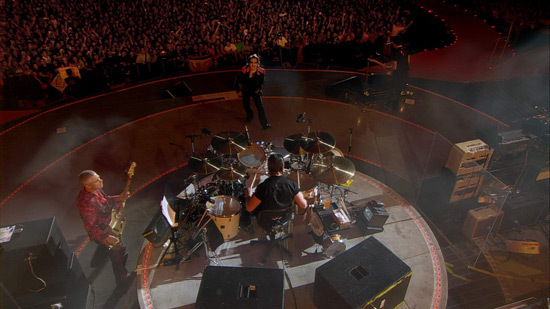 It is Bono’s dedication to the music and the message that shines throughout the movie. Not many people could stand in front of a soccer stadium full of people and wear their heart on their sleeve, and not give a damn what anyone thinks of their posturing and posing. But Bono is up to the challenge. It is his showmanship, along with the rest of the band that makes their performances so enchanting and exciting and it carries over to the movie as well. The IMAX and 3D format is perfect for filming a concert- at the end of songs I felt like applauding and, during the more touching moments of the show, (‘Love & Peace Or Else,’ ‘Sunday Bloody Sunday,’ and ‘Pride In the Name of Love,’ back-to-back-to-back,) I found myself completely swept up and caught up in the emotion of the moment. While it’s always sort of surprising to find music affecting you to this degree when you’re sitting in row ZZ at the Giaganto-dome, to have the same affect on the screen is also equally quite an achievement.